Who else then to direct the Entebbe raid true story than Brazilian director, José Padilha who helmed the excellent documentary BUS 174 way back about the hijacked bus in Rio de Janeiro? 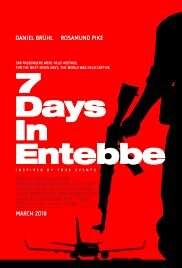 But despite the impressive cast and crew, 7 DAYS IN ENTEBBE that unfolds from Day 1 (June 25th,1976) to Day 7 is incredibly boring. 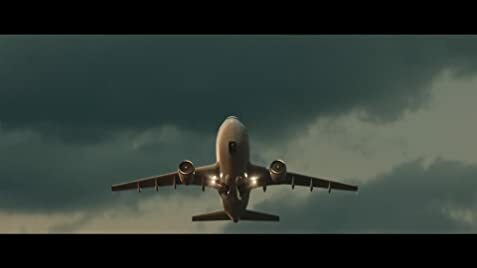 The film is based on the real life rescue of the hijacked Air France passengers in Uganda by Israeli forces. The plane was hijacked from its Athens, Greece departure by a group of 4, 2 Germans, Brigitee Kuhlmann (Rosamund Pike) and Wilfred Bose (Daniel Bruhl) and 2 Palestinians. Instead of centring on the actual raid and heroics, the script by Gregory Burke focuses on the conflict between Israel and Palestine. The film itself begins with a reminder of the fact that an Israeli state was formed in 1947 and fighting between Palestine and Israel has been going on ever since – the fighters for liberating the land back to Palestine known to the Palestinians as Freedom Fighters but as terrorists to the Israelis. The film contains a lot of talk behind the scenes of the planning, between Minister of Defence, Shimon Peres (the always excellent Eddie Marsan in extreme makeup) and Israel Prime Minister Yitzhak Rabin (Lior Ashkenazi). There is also a debate on the insufficient funds in the defence budget. One of the soldiers has a girlfriend in dance. He is advised by a fellow soldier to have her join the army or be forever apart. This explains the dance scenes in the film. The dance sequences appear at length not only at the start and end of the film, but interspersed at other points during the film. Besides the soldier’s girlfriend being in dance, what are the dance sequences really doing in a supposedly action film? The dance metaphor, if there is one, surely escapes me. Anyway, too much time is wasted watching the dancers in tights prancing around on stage. The dance sequences go right into the closing credits. Acting is surprisingly good with a jolt of hilarity provided by Nonso Anozie in the role of Dictator Idi Amin. Bruhl and Marsan also stand out. The individual film scenes are well directed by Padilha. But the problem is that they all do not come together as a whole or for the right purpose. A film that stresses the needed peace agreement between Israel and Palestine should not be one that centres on heroic Israeli forces rescuing a hijacked plane.